The Father of library science of India, Dr. Siyali Ramamrita Ranganathan (1892-1972) once described Paul Otlet and Henri La Fontaine as the builders of Universal Decimal Classification (UDC) scheme, though this scheme was not newly introduced but adopted from Dewey Decimal Classification (DDC) scheme of Melvil Dewey. Actually, DDC scheme was developed by Melvil Dewey in 1873 while working at Amherst College library in New York. He assigned the classification codes to the books of that library collection. In 1876, he published the classification in pamphlet form with the title “A Classification and Subject Index for Cataloguing and Arranging the Books and Pamphlets of a Library”. The foresight of DDC scheme was initially thus just to arrange a particular library collection in a more systematic way to enable easy and quick retrieval. This DDC scheme is the basic foundation of the Universal Decimal Classification (UDC) scheme. In 1885, Otlet and La Fontaine created Universal Bibliographic Repertory (Répertoire Bibliographique Universel) (RBU) which was intended to become a comprehensive classified index to all hitherto published information. The development of such a universal index essentially needs the arrangement of the entries. Again, the annual growth-rate of literature at the last decade of 19th Century was around one lakh books and ten lakhs periodical articles. To keep track of this ever-swelling flood, an International Bibliographical Conference was held in Brussels in 1895, the outcome of which was the foundation of IIB. The basic purpose of IIB was to maintain an up-to-date universal bibliography of all documents in cards. The two distinguished Belgian scholars, founders of the IIB, Paul Otlet (1868-1944) and Henri La Fontaine (1864-1943) sought permission from Melvil Dewey (1851-1931) to use and expand Dewey Decimal Classification scheme (DDC) for arranging items in the bibliography. At first, they got permission to translate the scheme into French. The idea of mere translation eventually proliferated into a number of fundamental innovations that led to the adaptation of the purely enumerative classification (in which all the possible subjects are already listed and coded) into another scheme that allows for synthesis, i.e. the construction of compound numbers to denote interrelated subjects that could never be exhaustively foreseen. It is interesting to note that, La Fontaine received Nobel Peace Prize in 1913, the memorable year for India while Rabindranath Tagore received Nobel Prize in literature and he was the first Laureate from Asia. In its first edition in French “Manuel du Répertoire bibliographique universel” (1905), the UDC included many features that were revolutionary in the context of knowledge classifications. The Tables of generally applicable (aspect-free or a specific context-free) concepts, known as common auxiliary tables along with a series of special auxiliary tables with specific but re-usable attributes in a particular field of knowledge made this scheme much more flexible. The UDC was actually a very big project; it was not just the development of a classification scheme for book arrangement on shelves in any particular library. The project envisaged the indexing of more than twelve millions global literature. Any project needs funding, and similarly, IIB was formed to sponsor UDC. The IIB was formed on 12th September 1895 at Brussels. It was renamed as International Institute for Documentation in 1914; International Federation for Documentation in 1958; and International Federation of Information and Documentation (FID) in 1986. FID was closed down in 2000 due to financial breakdown. The basic objective of UDC was to organize 12 Million global documents consisting of books and articles in periodicals to compile a universal bibliography, i.e., a Repertoire Bibliographique Universal. Such a compilation needs a system for arrangement of entries in this universal bibliography, i.e., a systematic list of technical literature published anywhere in any subject and language, and since ancient times. Otlet and La Fontaine first envisioned a city of knowledge in 1910, which Otlet originally named the Palais Mondial (World Palace) that would serve as a central repository for the world’s information. It was closed in 1922, due to lack of Government funding, but was reopened after initiative from Otlet and La Fontaine. Otlet renamed the Palais Mondial as Mundaneum in 1924, which eventually contained 100,000 files and millions of images. The Decimal Classification was in the fourth edition in 1894. The DDC’s pure notation of Arabic numerals impressed La Fontaine and Otlet. Subsequently, IIB adopted DDC scheme. A new epoch was started in the history of classification. An enumerative scheme found plenty of new avenues in facet analytical approach. The main class of DDC remains almost unchanged, (except the language class was shifted from 4 to 8) and numbers of synthetic equipment for class-number synthesis for micro-documents or multi-faceted documents were introduced. Those synthetic equipments gave new dimensions to DDC. In the title of the Review, though Otlet is described as a lawyer, actually by profession, Paul Marie Ghislain Otlet was a Belgian author, entrepreneur, lawyer and peace activist. In the book, Alex Wright showed that Otlet’s all professional identities were overshadowed by his one modest vision, i.e., to harness the entire human knowledge. Also, not only did he want to only store that information, but he also wanted to enable its access to the world’s population. He argued that libraries were an inefficient way to store information, as books were cumbersome, hard to update, and subject to author’s own biases. Otlet wanted to probe the boundaries of the books to unveil the content and context imbibed therein considering the Dewey Decimal System as the starting point. Today Otlet’s Universal Decimal Classification system is recognized as the foremost knowledge classification scheme where rigorous experiments are done with the faceted approach. The philosophical interpretation of facet was first given by Ranganathan, while Otlet was the first who put a faceted application in practical use. Otlet viewed bibliography in a way as a database of information that could easily be sorted, searched, and updated in the year 1895, when the concepts of micro-processors and computers were far away. So Otlet and his partner Henri La Fontaine started manually recording history’s greatest thoughts and ideas on 3x5 index cards or catalogue cards that may be reckoned as the world’s first information chip. Their project was known as the famous Universal Bibliographic Repertory project. Within a year’s time, they finished 400,000 entries recording books, speeches, sheet music, medical journals, museum pieces, even newspaper and poster advertisements. By 1896, Otlet started a fee-based mail-in research service. In this context, Otlet and Fontaine may be reckoned as the forefathers of Wikipedia. Over the next decade, their bibliography reached millions of entries. Otlet connected his native Belgium to the world by means of vast collections of cards that brought together everything that had ever been put to paper. He devoted himself to create a universal bibliography of all published knowledge that ultimately totaled more than 12 million individual entries, which was evolved into the Mundaneum, i.e., a vast “city of knowledge” that was opened for public in 1921. By 1934, Otlet planned for a network of “electric telescopes” that would allow people everywhere to search through books, newspapers, photographs, and recordings, all linked together in what he termed a reseau mondial or a worldwide web. Therefore, Otlet may be truly said as the Father of Internet, who dreamt such an electric telescope to visualize knowledge everywhere forty years before the advent of the internet. At 1894, after finishing the initial 400,000 entries, Otlet looked for a classification system and subsequent search device that could cover several subjects. Otlet’s interaction with Melvil Dewey occurred perhaps at this instant, which requires more research. After Dewey’s permission of translation, Otlet started work in full swing. In 1904, he published a more advanced version of his Universal Decimal Classification system. In March 1920 Otlet was invited to Rome to survey the documentation services, needs, and collections of the International Institute of Agriculture, which was founded in 1905. After Second World War, both its assets and mandate were handed over to the Food and Agriculture Organization (FAO) of the United Nations. Otlet spent more than a fortnight there, and the report of his study was published in 1921. He was also requested contemporarily for information about bibliographical classification and the management of libraries by Duyvis, who was then instructed to develop a library at the Dutch Patent Office. Duyvis visited Brussels to study the methods of the IIB at first hand. Alex Wright also touched some consequences of discordance between Otlet and Donker Duyvis as the conflict between them sometimes became very serious. Actually, not only with Duyvis, both Otlet and La Fontaine came across several conflicting situations due to generation gap with their successors in IIB. It is true that the dream of universal knowledge is a classical concept, perhaps since early Vedic period. Maharshi Vyasdeva also carried out a huge documentation of the then knowledge that resulted in Mahabharatam or Harivangsham. The knowledge society is a classical concept that achieved a new dimension in the digital age. From the archives of Sumeria to the Library of Alexandria, humanity has long managed with information and organizes intellectual output. The organization in intellectual production was revived during the period of renaissance. What the dream for knowledge organization grew by the late nineteenth century was embraced by many visionaries in this domain. Among them, Alex Wright presented the contributions of Paul Otlet very picturesquely. 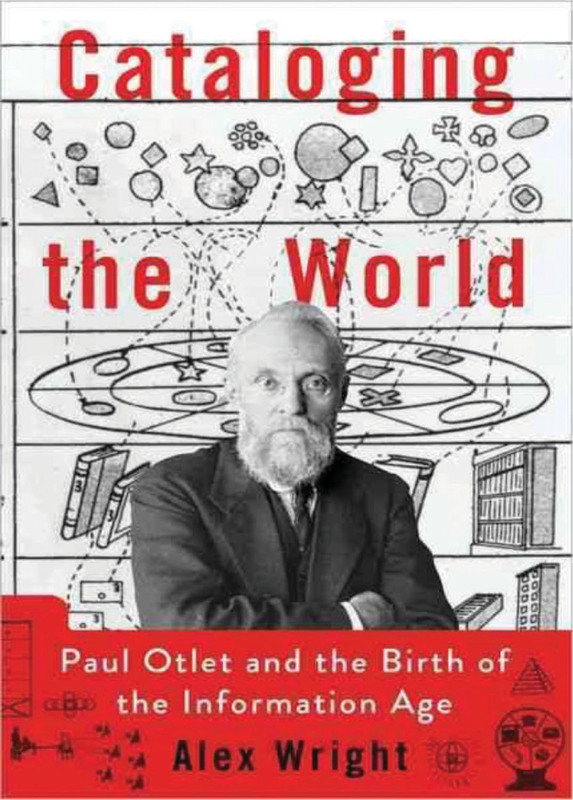 This book also serves as a very well-presented biographical account of Paul Otlet. In the book, Otlet is very appropriately held the legacy of the visionaries since long who dreamed unifying the global knowledge from H.G. Wells to Melvil Dewey to Ted Nelson and Steve Jobs. Wright shows that his legacy persists in today’s networked age, where Internet corporations like Google and Twitter play much the same role that Otlet envisioned for the Mundaneum as the distribution channels for the world’s intellectual output. This book rings the eternal bell of people’s quest for knowledge and the zeal to organize the same.